Do you remember years ago when you begged your mother to put out your favorite green shirt the night before school so that you would not get pinched at school? Aaaaah, childhood memories are the best! Fast forward years later and instead of deciding what green shirt to wear, I search for what green cocktail will be my choice for the day. 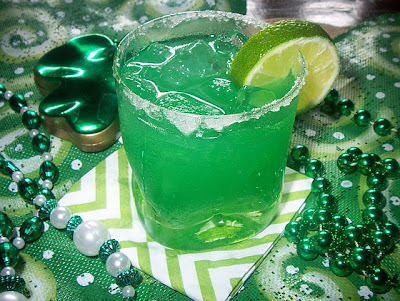 Searching the vast internet for green cocktail ideas, I stumbled on a delicious sounding Key Lime St. Patrick’s Day cocktail. I could hardly wait to gather up the ingredients and make this tasty sounding libation. Cut lime into small wedges. 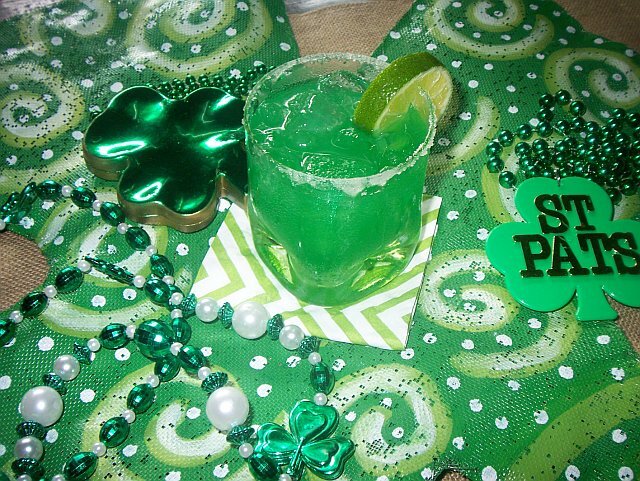 Put the lime wedges, four ounces of vodka, and one and a half ounces of thawed limeade drink(frozen concentrate), & one teaspoon of vanilla in a cocktail shaker . Add two or three drops of food color. Add a splash of ginger ale. Cover with ice. Shake the mixture well. Strain into your favorite green glass. You may rim the glass with sugar. Yummy! Go ahead. Try it today. And what an appropriate candle by Lux for St. Patty's Day. 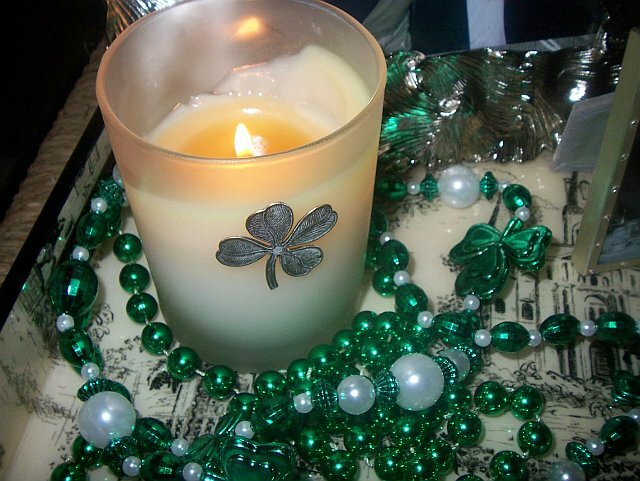 The candle is called "Good Luck" and smells of fields of clover. The candle was purchased last year from House of Fashion in Thibodaux. 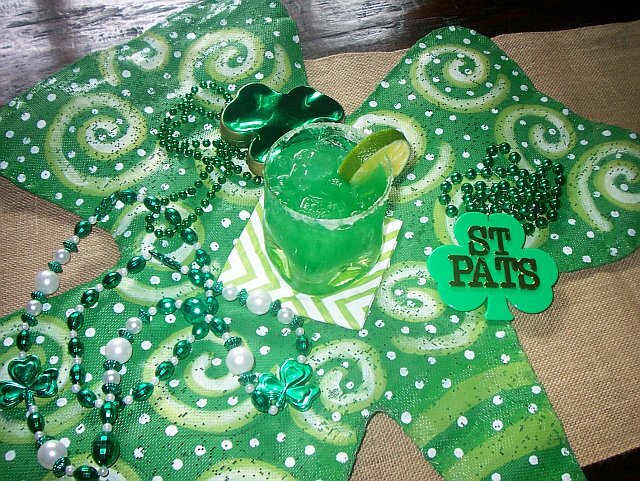 Happy St. Patrick's Day Ron and J. I loved your green tees at the parade AND your Red Sox hat. I would love to try that cocktail, it looks yummy. I'm making the whole boiled dinner and an Irish soda bread. 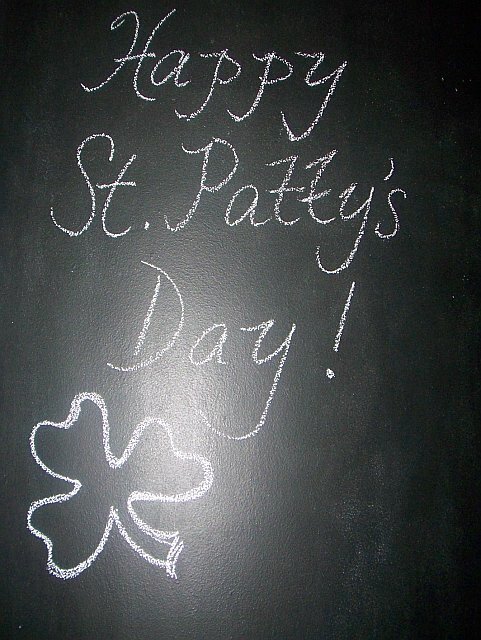 My mother was from the beautiful Beara peninsula in County Cork, so I have to celebrate. My cousins have an Irish pub and restaurant and one of the husbands is in an Irish band that will be playing, so everyone's invited to meet up for the evening. You live in such a fun-loving town; I love to hear about all your jaunts. Have a great evening. Kathy S.